Freedom Camping is a result of an Act of Parliament which was to allow supporters of the 2011 Rugby World Cup to camp in designated freedom areas and is now being abused by travellers. Nowhere in the legislation does it say that areas designated for Freedom Camping are to be FREE. There is a cost to every community to provide these facilities. Freedom camping should not be a cost to the ratepayers or a reduction in their enjoyment of their community. Lines of non-complying small vans with self-contained stickers parked in reserves is not right. These are freeloaders. The stays should be charged at a price to cover all costs of providing for the freedom camping place. Collection of the nightly fee is not difficult with mobile eftpos and credit card facilities. Also, the freedom camping areas should not environmentally impact on the community. Freedom camping locations should only be where there are public toilets. And then transparently determine a fee per night which is to be paid by each freedom camper. There should be no subsidy from the ratepayers or central government. Another observation from the TCC reported data, is the uselessness of issuing infringement notices and not collecting the fine then and there. Chasing any offender is a waste of resources and money. I see now we have Freedom (unofficial) Camping outside the Papamoa Library. Special events could allow short term camping in carparks with toilets provided. As a note, in Australia there is a law which forbids freedom camping within 15km of a town. Our recommendation is to reduce the number of spaces available on a sinking lid policy and charge at a commercial rate for those spaces that will be available. “More than $140,000 worth of freedom camping fines have gone unpaid in Tauranga City. The Tauranga City Council issued 971 infringements under the Freedom Camping Bylaw in the last financial year - and of those fines, only 258 have been paid. In a report presented to the Tauranga City Council's Community and Culture Committee, 334 of the issued fines were waived as the offenders could not be located, particularly overseas visitors, and 379 fines were being processed through the courts for non-payment. The fine for breaching the Freedom Camping Bylaw was $200, which meant $66,800 worth of freedom camping fines had been waived. Team leader of parking and bylaws Stuart Goodman said an infringement notice was issued to a vehicle, not a driver. "If a fine is not paid within 28 days, a reminder notice is issued. An overseas visitor who has not paid their fine has most likely left the country by this time," Goodman said. He said New Zealand did not currently have the legislation to enable a rental car company to on-charge a freedom camping fine like they could for a speeding fine. "This issue has been raised by the Responsible Camping Working Group," he said. Tauranga Mayor Greg Brownless agreed the main issue was that there was no legislation to enforce overseas travellers paying infringements issued by the council. Preliminary SmartGrowth Email Summary from Forums held around City. Thank you again for the very helpful submission you made on the Future Development Strategy and the Tauranga Urban Strategy. The key themes to emerge from consultation undertaken in October on the Future Development Strategy and Tauranga Urban Strategy were discussed at yesterday’s SmartGrowth Leadership Group meeting. People want to see aspirational visions and ambitious, aggressive targets set in support of greater levels of infill and intensification. There was also strong support for further investigation for fast-tracking development in eastern areas like Paengaroa, Pukehina, Pongakawa and Rangiuru. Enabling the development of Māori-owned land and addressing Māori housing needs featured strongly too. Transport was a key issue for people who responded with support for a comprehensive and ambitious, multi-modal, integrated transport plan with a 30 to 50-year horizon. Submitters told us that they want to see better public transport and many were in favour of including rail as part of the mix with a network of park and rides. Partner council staff will continue to analyse the submissions and report back to the Leadership Group in early 2019 before final decisions are made on the Future Development Strategy and Tauranga Urban Strategy. The Leadership Group members have called for an integrated response across several workstreams. Click here to see the Minutes of the October Meeting. Click here to see the Minutes of the September Meeting. The June Meeting was held in our new venue of Legacy Gardens. The seats were very comfortable, a good sound system and very informative presentation by Jordan Williams , Executive Director of The Taxpayers Union. The Taxpayers' Union is a grassroots activist group, dedicated to being the voice for Kiwi taxpayers. We stand for value for money for government spending. Our mission -- Lower Taxes, Less Waste, More Transparency. We are a lobby group, not a think tank. See https://www.taxpayers.org.nz/ . In particular look up the Ratepayers Report to see the ranking of Tauranga City Council in many metrics. Quick Tip -- use the metro button to see TCC results quicker. TCC numbers do not include a component for rubbish and waste pickups, included in other centre's numbers. Its good to see commonsense has prevailed. Let’s sort the infrastructure out and keep rates rises to a minimum before we commit to projects we can ill afford. The PRRA is looking forward to working with the new CEO of Tauranga City Council, hoping he will take a close look at Council spending, control rates rises and take an interest in the growth and infrastructural development for Papamoa, along with the upgrade of Papamoa Beach Road, which has been sadly lacking for years. 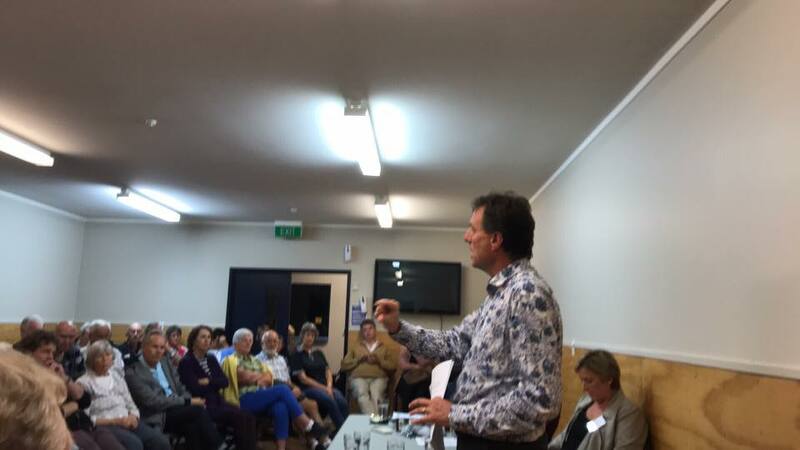 Kelvin Clout - Deputy Mayor, Tauranga City addressing another ‘standing room only’ meeting at the meeting tonight. I think he’s the best Deputy Mayor we’ve had in the last four years. Thank you to those who attended tonight’s PRRA meeting which proved to be informative as well as generating good debate with Councillors Clout, Morris and Robson. Our thanks to them for addressing community concerns and John Cruikshank from Kleana Bins for addressing the issues arising from the Councils proposed changes to rubbish collection. In future though, if members wish to raise any matters with Councillors, could they first email Wayne to wayne@waynegeorge.co.nz so that they can be briefed beforehand. We would prefer to be more focussed on matters at hand during meeting time. Monthly Meetings Minutes - Feb 18. Financial Report to December 17. Letter to TCC Mayor and Councillors February 21st 2018.